In case anyone is wondering, I thought today I'd show you the original image that's used as the header photograph for this site. 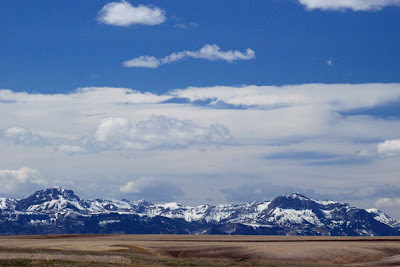 It's a shot of the Rocky Mountain front, taken last spring from the highway near Choteau. I know I've said this before, but in many ways the drive from Wolf Creek to Browning is my very favorite in the whole state ... the mountains on one side, and the prairies on the other. It's quintessential Montana, for sure. Where ya be, Mark? Ill? Away? Just taking a break? Still here ... more or less, at least! Just a little craziness at work, combined with some family health issues. Hopefully I'll be able to get caught up before too long. Hi from Oakland, CA -- I've been devouring your blog lately, the photography and writing is wonderful! What the best time of day to take this drive from Wolf Creek to Browning? We are headed out to MT in August to spend a week or so at GNP around Polebridge -- and we really look forward to the fantastic drives to and from the park. Many thanks for stopping by, and saying hello! It's always nice to know who's out there. And thanks for the good words, too. As for the drive, the best time to take it is late on a spring afternoon, right after a thunderstorm ... but I realize the choreography for that would be a little difficult. :) In general, though, as a photographer I like the early mornings and the evenings the most -- that's when the light is at its best. That's true most anywhere, I think. Hope you have a great trip! If you're heading to Polebridge, you should know that it's one of my very favorite spots on earth. An evening spent at the Northern Lights Saloon is pretty much impossible to beat! Thanks Mark!!!!!! We are really excited to get to Polebridge -- we are staying about 5 miles from it, up the road inside GNP - at a private home we rented right on the river -- the McFarlane Ranch. We can't wait to hit the Polebrige Merc for baked goods! Thanks for the great advice on MT, we love our long drives and plan get a couple good ones in!! !